Australian gambling market was never perfect, but it was close to that. Despite the lack of clear legislation, Australia punters players could enjoy a wide variety of top notch sites, including world known leaders such as 888, Poker Stars, Spin Palace and others. All that is about to change now, with the approval of the IGA bill (Internet Gambling Amendment Bill 2016). Remember that date. We won’t go into technicalities of who said what, but focus on explaining how it worked till know, what will be and what you should pay attention to while gambling online, post August 9th, 2017. We need to say few words on how Australian market worked. As we said, in was never legislated as in UK for example, but due to lack of clear laws, it was one of the best places to gamble online. We need to “thank” our government for that. The thing is that Australia passed a bill that restricts online gambling more than 16 years ago, with Interactive Gambling Act of 2001. IGA made it illegal for Aussie companies to offer services to local players. This bill shows how little understanding they had on how internet works. It had zero effect on the players, since they could enjoy hundreds of world’s bet online casinos, poker rooms and betting sites which entered the multibillion $ Australian gambling market (Aussies are ranked f#1 in the world for gambling expenses per resident). Would you like to guess the name of the only country that didn’t see a penny of all that? You got it right: Australia. Forget about taxes and money, think just of the amount of jobs it could create. Anyway, now it’s not relevant. So let’s see what happened on August 9th. Very briefly, the 2016 IGA makes it illegal to all companies to offer almost all online gambling products to Aussies. It was first introduced a year ago and was expected to be approved sooner rather than later. You could already spot the changes when companies like 888, Guts and others pulled out earlier this year, but now it will become an exodus. We expect that all current companies will pull out within days or weeks. So the question is – What’s Next? So we cannot gamble online anymore? Far from that. As we’ve learned from similar events in USA (2006), France (2010) and others, the online gambling market in Australia will continue. Lower numbers indeed, but not by much. 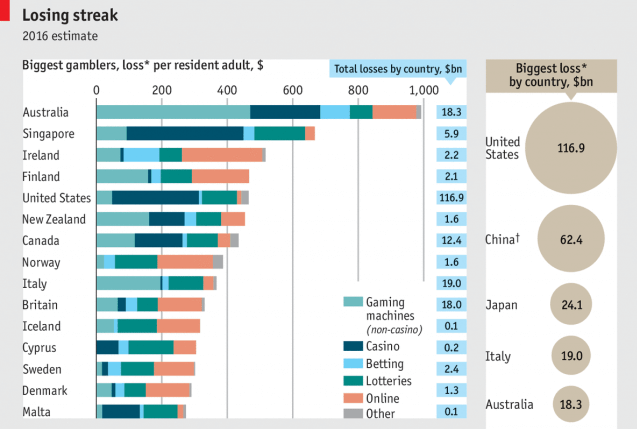 United States bill was much stricter and yet US casino market still rolls billions of dollars. The thing is that in current stage of internet and global economics – it’s almost impossible to stop people from doing online whatever they feel like. (Unless you’re China and even then, it’s not easy). There is an endless number of casino companies which focus on black/grey markets. For them, it’s Christmas. You probably noticed new Australian online casinos open up, managed by companies that never stepped foot here before: Joe Fortune, FairGo and lately Ignition casino. This is just the tip of an iceberg of what going to happen here in the next months. So Gambling isn’t Safe anymore? Here the answer is more complicated. It’s not “not safe”, but there are far more pitfalls and you need to be discriminative and do your homework. The thing is that the reason why these companies can operate in so called illegal markets is that all of them licensed off-shore, beyond the reach of various authorities. Naturally, that opens the door for low level and even fraud operations, managed by quick buck chasers. Luckily, not all them are like that. Ignition and Joe Fortune for example are powered by the company behind the Bodog brand, one of the oldest and most reputable casinos worldwide. Ignition is actually the most popular USA casino and poker room. They do know how to treat players on the same level as 888, Party and others. How to keep gambling safe post IGA? The question is, how to separate the good from the bad. Here are some simple rules for you to follow. Check their history. Us gamblers, we always campaign but you need to see that when it comes to payouts, their history is crystal clear. Stick online to Australian casinos with instant withdrawals. We’ve explained in depth why withdrawal speed is the most important factor to determine casino authority and fairness. Bottom line: you can still enjoy safe online casinos, but the innocence is gone. Good luck and enjoy this 2003 hit by Stereophonics which we think suits this moment.